Ideal for new builds, with retrofit solutions available. Under floor central heating is the simplest way to ensure any room, large or small, is heated efficiently, evenly and comfortably without cold corners or cold floors. Under floor heating means no radiators and therefore clear walls with useable wall space. It provides greater room comfort because of its uniformity of temperature and also because of the benefits of warmth at floor/foot level. Floors can be covered by a wide range of floor finishes including carpets, ceramic tiles, vinyl or wood. It is very low maintenance and Polypipe guarantee all the components under the floor for 50 years. Griffiths are accredited Polypipe Under Floor Heating Installers and offer full system design and installation service. Ideal for new build/new floor areas. 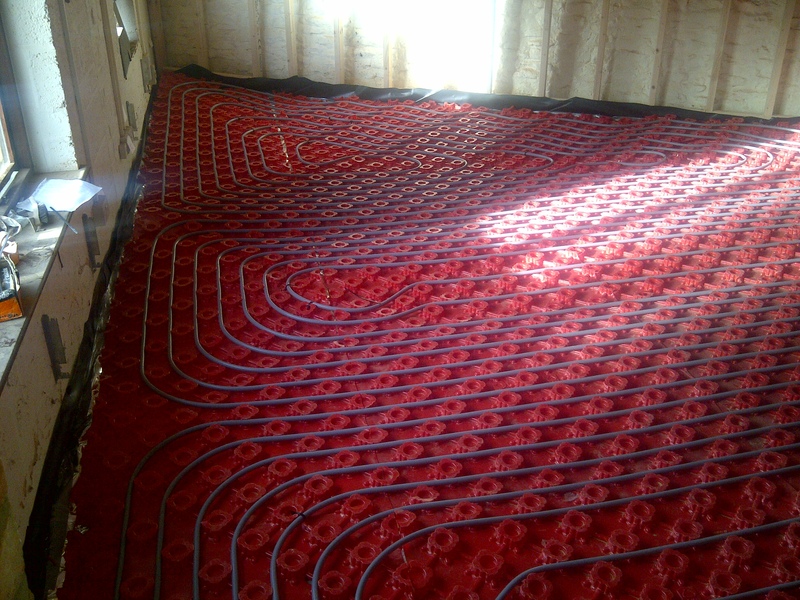 Heating pipe work is laid within a castellated floor tray, which is then covered with either a conventional dry or liquid floor screed. 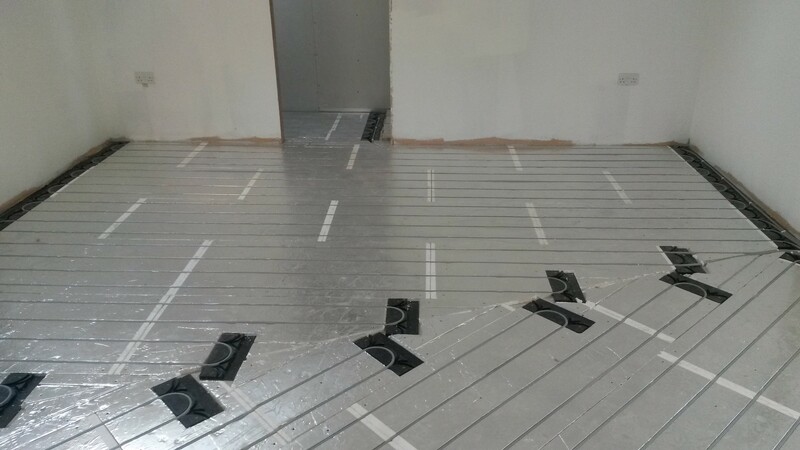 The floor trays suspend the heating pipe work, creating a greater contact area of the floor screed to the heating pipe work. Griffiths purposefully design our 'solid' floor systems with 18mm heating pipe (over conventional 15mm) at 100mm spacings. The larger 18mm pipe provides a greater surface area of the heating pipe, in-turn creating a faster response time; the 100mm pipe spacings ensuring a even floor temperature. Ideal for retrofit or timber first floors. 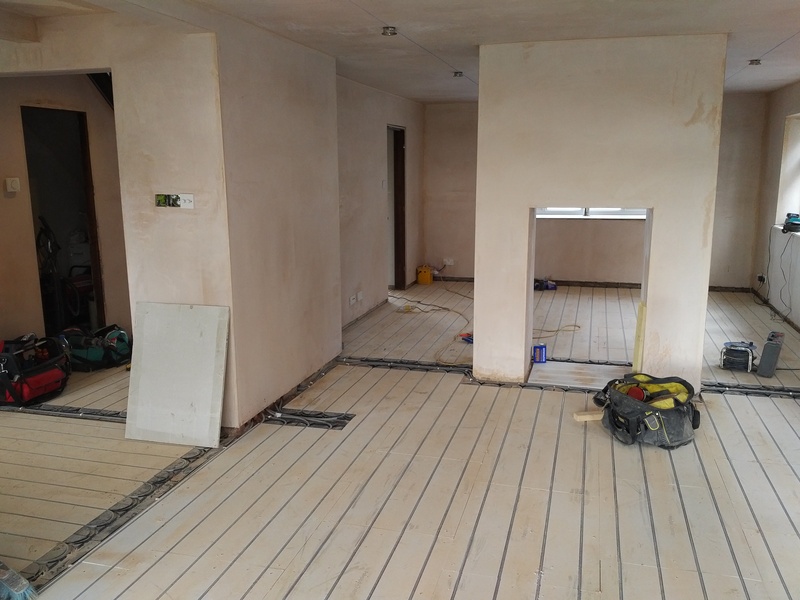 Routed panels are laid over existing floors or screed bases; the heating pipe work is then laid within the 'grooves'. For lightweight floor coverings (e.g.. Laminate, Vinyl or Carpet) a 'Lite' polystyrene floor panel is used, for heavier floor finishes (e.g.. Tile or Hardwood) a dense fiberboard floor panel is utilised. Tile, hardwood or laminate floor finishes can be laid directly onto the floor panels; for carpets/vinyl floors a 6mm plywood covering is recommended. The system utilises pressed aluminium 'plates', installed in-between the floor joists, in which the heating pipe work is laid. Insulation is required below the spreader plates to ensure all heat energy is reflected upwards. 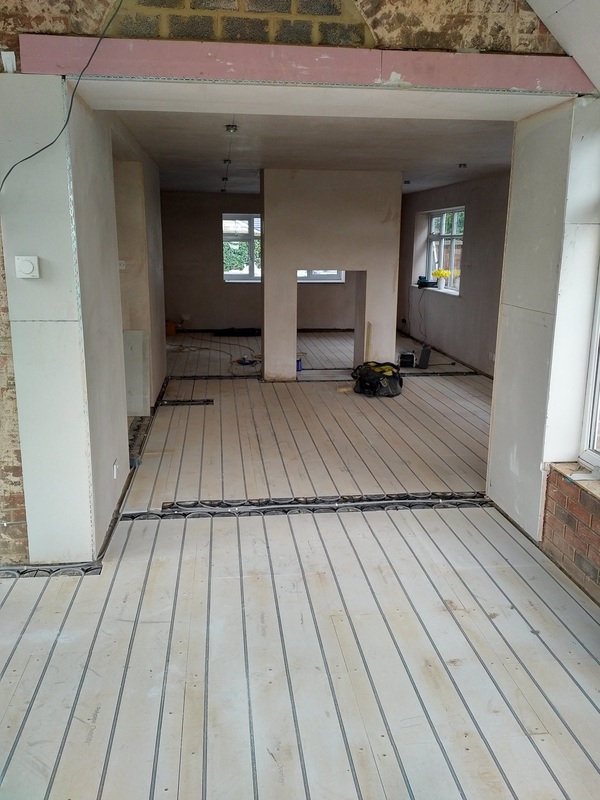 Conventional chipboard flooring is installed on the floor joists. 'Circuits' - The term which refers to the coil of pipe installed in the floor, each circuit is connected to a central manifold. Depending on the size of a room, multiple pipe circuits may be required in a single room. 'Manifold' - A Manifold is a central point in which all the floor heating circuits are connected. The manifold allows for individual control of heated water circulating throughout the circuit, in-turn individual room temperature control. 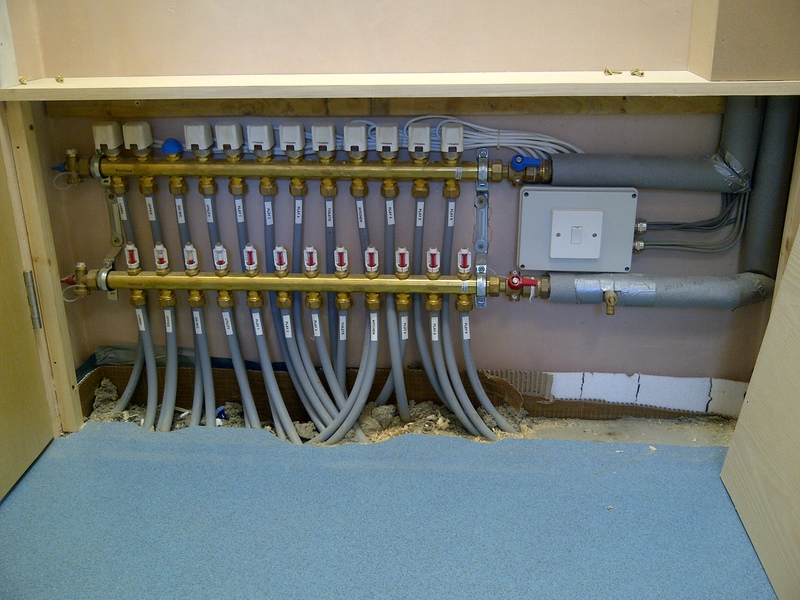 'Zones' - Generally the under floor pipe work circuits are laid to provide heating to rooms individually. This allows for separate temperature control to a individual room via a thermostat. Heating 'zones' are the area/room controlled by a individual thermostat. 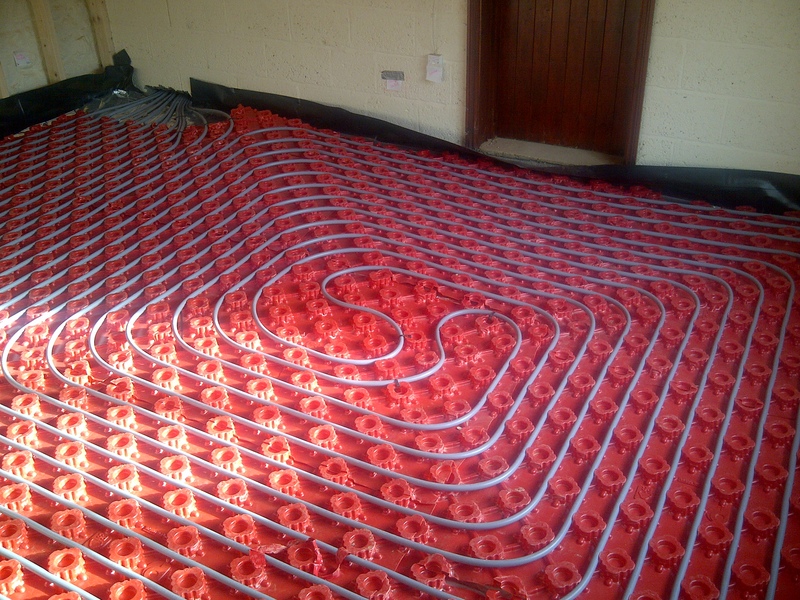 Griffiths can specify an under floor heating system maximise the efficiency of a connected heat pump. We design our under floor heating systems with a larger 18mm pipe, laid at 100mm spacings, using Polypipe's 'solid' floor red castellated floor trays. The pipe is spiralled into the centre of a room, providing a 'Flow then Return' piping pattern. We have, from experience, found the 18mm pipe (with a larger surface area) suspended in the floor trays, provide a greater contact area with the floor screed...In turn a more higher heat output. This allows the heat pump to be run at a lower temperature, returning a greater operating efficiency. The spiralled floor circuits, provide a even heat distribution throughout a room.